No matter where you live, Mother Nature’s punishing effects on your house become very evident over the years. Seasonal temperature and weather changes can result in mold and mildew formation, cause paint to peel, form cracks, or damage the house in a number of other ways. We all want our homes to stay protected and also be aesthetically appealing. Choosing the right house paint color can go a long way in achieving these goals. Listed below are some quick tips for choosing a house paint color that will give you years of beautiful protection. Choose an appropriate color scheme. This should not only look good on your house, but also go well with neighboring houses. Choose colors that blend well with other houses in the neighborhood. If you want your house to stand out, it should not clash with the surroundings, but stand out in a subtle manner. Think about architectural details and surroundings. The architectural elements of your house should be showcased by using colors that bring out its uniqueness. For example, if your house is a Mediterranean style villa, terracotta oranges, weathered whites, and browns are ideal colors to use for the exterior. Similarly, the surroundings also dictate your color choice for your home. Beach homes, for example, look better with pale shades of blue, white, tan, and yellow. For simple houses, one or two colors are sufficient. But for a more elaborate Victorian style home, plan on using five to six colors. Also remember that light colors make a house look bigger, while darker shades make it look smaller. Choose colors that look good at all times. Whether you view your house in the daytime or late in the evening, choose house paint colors that are not camouflaged in the surroundings. Mountain homes, for instance, can use natural wood stained siding, but should not use any green shades so that the house does not blend into the evergreen trees surrounding it. Exterior colors should be in harmony with interior paint. Consider the color scheme inside your home and avoid extreme contrasts between the outside and the inside. Think about protective attributes. Other than aesthetics, a good paint that is superior quality and has been applied properly will safeguard your house against mold, mildew, and UV radiation for a long time. Go environmentally friendly. All exterior paints have fungicide, and the best environmentally friendly choice is to buy a paint that has zinc oxide as the fungicide. Use low- or zero-VOC water-based paints. High-VOC paints are oil-based and are best avoided. By choosing the right paint for your house, you are not only protecting it and making it look beautiful, you are also increasing its value. If you plan to paint your house on your own, it does not need to be a chore. 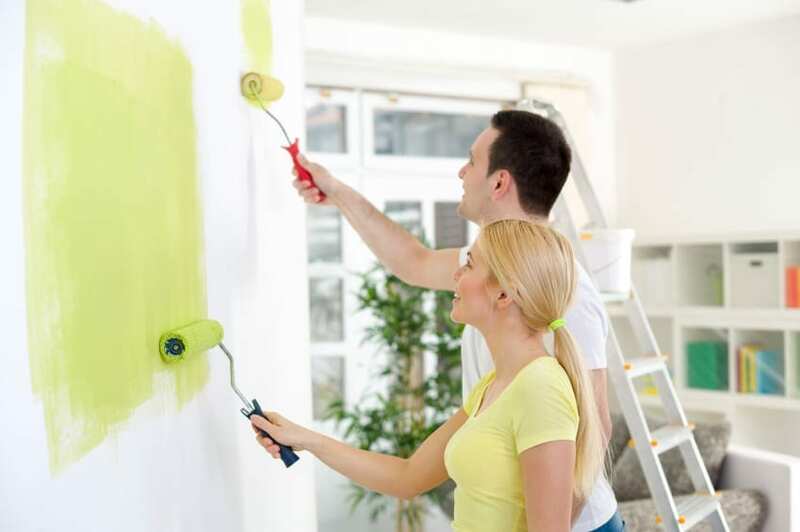 Make it a family activity and take your time to get the painting job just right. You can even involve the kids to paint certain parts of the house.